Wikimedia Commons has media related to Shops in London. Pages in category "Shops in London"
Gieves & Hawkes are a bespoke mens tailor and menswear line located at 1 Savile Row, founded in 1771 and owned by the Hong Kong conglomerate Trinity Ltd. Gieves and Hawkes is one of the oldest continual bespoke tailoring companies in the world, the company holds a number of Royal Warrants, and provides ready-to-wear as well as bespoke and military tailoring. The current creative director is Jason Basmajian, formerly of Brioni, Gieves & Hawkes business was originally based on catering to the needs of the British Army and the Royal Navy, and hence by association the British Royal family. After coming to London in 1760, Thomas Hawkes set up his first shop in 1771 in Brewer Street and his main clients were commanders of the British Army, through which King George III became a customer. He expanded his operation by moving to No.17 Piccadilly in 1793. In 1835, James Watson Gieve was employed by Old Mel Meredith, Meredith tailored the uniform that Admiral Lord Nelson was wearing when he was killed in action aboard HMS Victory at the Battle of Trafalgar. In 1852, Gieve partnered with Joseph Galt, and in 1887, on 23 December 1912, Hawkes & Co. bought №1 Savile Row from the Royal Geographical Society for £38,000, in part because the firm had dressed so many explorers. In 1974, Gieves Ltd acquired Hawkes & Co. and the freehold of 1 Savile Row, the company was renamed Gieves & Hawkes. In 2009, Kathryn Sargent of Gieves and Hawkes became the first female head cutter in Savile Row and Diana, Princess of Wales. The company produces the uniforms for the Honourable Corps of Gentlemen at Arms, the company was bought by Hong Kong-based property developer and garment manufacturer USL Holdings Ltd in 2002, having listed unsuccessfully as a Plc. The Savile Row flagship store was renovated in 2011 and transformed into a menswear emporium, in October 2011, Gieves & Hawkes sponsored the Scott-Amundsen Centenary Race conducted by six serving soldiers of the British Army, with all proceeds going to the Royal British Legion. Gieves & Hawkes have a history of both service to the military, and hence to the British royal family. Cecil Court is a pedestrian street with Victorian shop-frontages in London, England linking Charing Cross Road and St. Martins Lane. Since the 1930s it has known as the new Booksellers Row. One of the older thoroughfares in Covent Garden, Cecil Court dates back to the end of the 17th century, a tradesmans route at its inception, it acquired the nickname Flicker Alley from the concentration of early film companies in the Court. However, it seems to be one of a number of streets and places that have been named for the land-owning family including Cranbourn Street. The street rose from the ashes to become the home of an eight-year-old Wolfgang Amadeus Mozart while he was touring Europe in 1764. For almost four months the Mozart family lodged with barber John Couzin, according to some modern authorities, Mozart composed his first symphony while a resident of Cecil Court. In September 2011, the Cecil Court Traders Association installed a plaque commemorating Mozarts relatively brief, the plaque sits at Number 9 Cecil Court, which - contrary to earlier assumptions placing the Mozart lodgings at Number 19 - has been confirmed as the site of John Couzins barber shop. The plaque was unveiled by actor and author Simon Callow, who created the role of Amadeus on stage, arising from this, the street is sometimes called Flicker Alley. ‘Flicker Alley’ was renowned as the place to buy or hire a film in Edwardian London, home-grown pioneers including Cecil Hepworth and James Williamson had their offices there, but so did international companies including Gaumont and American Vitagraph. According to film historian Simon Brown Cecil Court’s “importance has been cited by pioneer filmmakers. The earlier businesses tended to be one-stop shops - filmmakers and dealers in films, from 1907 the ‘new wave’ of businesses were often more specialised, dealers in the import and distribution of foreign films, or specialists in film rental or equipment alone. One business specialised in cinema confectionery, and for a time the trade periodical ‘The Bioscope’ was published from number 8, the US-based Flicker Alley DVD and film distribution company, founded in 2002, is named as a homage to Cecil Courts history. Biba was a London fashion store of the 1960s and 1970s. Biba was started and primarily run by the Polish-born Barbara Hulanicki with help of her husband Stephen Fitz-Simon, Bibas early years were rather humble, with many of the outfits being cheap and available to the public by mail order. The dress had celebrity appeal, as a similar dress had been worn by Brigitte Bardot, by the morning after the dress was advertised in the Daily Mirror, over 4,000 orders had been received. Ultimately, some 17,000 outfits were sold, Hulanicki worked as a fashion illustrator after studying at Brighton Art College in the late 1950s. She married advertising executive Stephen Fitz-Simon and they opened a mail order clothing company that she named Bibas Postal Boutique. Biba was the nickname of her younger sister Biruta, the first store, in Abingdon Road in Kensington, was opened in September 1964. Not one asked if there were any other styles or sizes, the brown pinstripe dresses were being stored in the shop because Hulanicki’s apartment was overflowing with boxes of clothes for their mail order service. Fitz-Simon dropped Hulanicki at the shop and went to pick up more dresses, Hulanicki went to the bathroom, the louder the music played the faster the girls moved and more people appeared in the shop. I had sold every dress by 11, after the last dress had been sold, people were still lining up inside waiting for the next delivery. The shops main appeal was what was seen on TV on Friday night could now be bought on Saturday, as the Biba style and logo became more and more recognisable, the more and more people wanted to be seen in it. The second store at 19-21 Kensington Church Street opened in 1965 and a series of mail-order catalogues followed in 1968, the next move, in 1969, was to Kensington High Street, into a store which previously sold carpet. Again, it was unique, a mix of Art Nouveau decor and Rock, on May 1,1971, a bomb was set off inside the store by The Angry Brigade. They claimed responsibility for it in Communique 8, which was published in IT magazine, the incident is referred to in Retro - the culture of revival by Elizabeth E.
Heals is a British furniture and furnishing store chain comprising six stores, selling a range of furniture, accessories and garden wares. For over a century it has known for promoting modern design. The original Heals firm was established in 1810 as a business by John Harris Heal. In 1818 the business moved to Tottenham Court Road and expanded into bedding and furniture manufacture, by the end of the nineteenth century it was one of the best-known furniture suppliers in London. Heals was run as a business designing and selling furniture, applied arts, interior decorating. The business has subsequently been in a number of trading as a retailer. The notability of Heals rests upon the achievements of Sir Ambrose Heal, Heal developed his business as a design and retail concern in accord with the philosophy of which he was a key proponent. Heal’s has operated since 1818 in Tottenham Court Road, and from the present site since 1840. Its first purpose-built store, completed in 1854, was one of the largest in London. This is one of the earliest known applications of architectural photography in Britain. The central part of the present building was commissioned by Ambrose Heal and designed by his cousin and it was completed in 1917 and is a distinctive modern building, immediately hailed as a landmark in shop architecture, subsequently extended in a number of phases. An extension on the side of the building was added in 1938. The new Tottenham Court Road store included an art gallery, the Mansard Gallery, the most influential exhibition held at the Mansard Gallery was the Exhibition of French Art 1914-1919, held in 1919. This was organised by the art critic Sacheverell Sitwell, included works by several artists and was the first British exhibition of Picasso, Matisse. The exhibition was received by modernist critics and received generally positive reviews in The Times. The Mansard Gallery closed in the 1980s, in 2010 an online version of the Mansard Gallery opened on Heals website. A second store was opened in Guildford in 1972 and the Company remained highly profitable until the mid-1970s and these included retailing, fabric conversion and wholesaling, cabinet furniture manufacture and bed and bedding manufacture. Cad and the Dandy is an independent tailoring company based in London, England with premises on Savile Row and in the City. It sells bespoke suits, manufactured from English and Italian fabrics, the company was founded in 2008 by James Sleater and Ian Meiers, two City of London bankers who were both made redundant from their jobs in the 2008 financial crisis. Cad and the Dandy was founded in 2008, the founders met through a supplier as both pursued a similar business idea independently, and they agreed to work together to start the company, each contributing £20,000 of initial capital. Both had family connections to the industry, giving them knowledge helpful in launching the new company. After initially conducting fittings in rented space, they came to an arrangement with Chittleborough & Morgan to allow appointments in their shop on Savile Row. 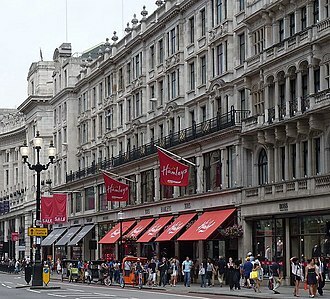 In October 2009, the company opened its first permanent store in the City of London, the company achieved a turnover of £1. 3M in 2010, and was listed by The Guardian in the Courvoisier Future 500. In July 2010 the founders won the Bento Entrepreneur of the Year Award at the Macworld Awards and in July 2013 they opened permanent premises on Savile Row. Based in London, where the company employs 10 tailors in three workshops, it employs an additional 40 in a workshop in China where most of its entry-level. All suits are made from British or Italian cloth, and are either in machine grade or hand stitched. Suit prices vary based on the cloth that is used as well as the amount of hand-stitching that is done on the suit. The fully hand-made suits require around 50 hours of stitching, include a basted fitting, prices are kept lower than the average for bespoke tailors by requiring payment up-front. This allows Cad and the Dandy to negotiate discounts of 30% to 40% with their suppliers, Cad & the Dandy launched a new flagship store at 13 Savile Row in June 2013. The store is the first on the iconic tailoring street to hand-weave a cloth before making it up into a finished suit. Fittings are now conducted across the UK, Europe and the United States, in 2010, the company began an association with former boxer Chris Eubank, who now designs a range of clothes for the brand. Arthur Beale is a yacht-chandler on Londons Shaftesbury Avenue, which stocks a wide variety of nautical equipment and accessories. The business started as the rope-maker John Buckingham by the nearby Fleet river in the 16th century and has based in premises in Bloomsbury since then. In the 19th century, they known as the exclusive suppliers of climbing rope to the Alpine Club. They still make and stock a variety of ropes and lines and so supply theatrical rigging and ornamental ropes for decoration. The business started as rope-maker, John Buckingham, on the Fleet river at the start of the 16th century. In the early 19th century, they had premises at number 6 in the Middle Row of St Giles—an impressive terrace in the middle of Broad Street—but had to move when this was demolished in 1843. They operated from premises on Shaftesbury Avenue when John Buckingham and the new proprietor, Arthur Beale, were exclusive suppliers of climbing rope to early members of the Alpine Club. This was made to the specification so that it was both light and strong, being made from three strands of manila hemp, treated to be rot proof and marked with a red thread of worsted yarn. Allders was an independent department store operating in the United Kingdom. Established in Croydon by Joshua Allder in 1862, Allders developed into a chain of department stores across England and its flagship store in Croydon was the third-largest department store in the United Kingdom. On 17 January 2013, the company closed the store along with the website, Allders was opened in 1862 at 102 and 103 North End, Croydon, as a linen draper and silk mercer by Joshua Allder from Walworth, who had served his apprenticeship in Croydon. His shop was diverse, with offers on silk dresses and a morning dress section. This diversity showed a shrewdness in business and an understanding of his female customers. Croydon was a town, and Allders business grew with it. In 1870, the shop expanded into 104,106 and 107 North End, although he had to wait for some 20 years to acquire 105 and he supported greater rights for his workers, being instrumental in getting local stores closed for a half-day on Wednesdays. Allder died in 1904 leaving a store which had expanded beyond clothing and haberdashery to sell glass and porcelain and his main residence in Pampisford Road, South Croydon, now houses Regina Coeli RC school, and two cul-de-sacs nearby are named Allder Way and Joshua Close. In 1908 Allders family sold the business to J. W. Holdron, owners of stores in Peckham and Leytonstone respectively. They developed the store into 50 departments with 500 staff and owned the business until 1921 and it passed to the Lawrence family, under whose control it became a limited company. In 1926, the famous North End facade was created, uniting the frontage of the Croydon premises for the first time. In 1932 the Arcade from North End to George Street was completed, which proved popular with its varied concessions. 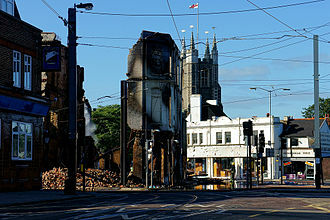 Allders was considered a pioneering retailer, the building suffered considerable damage in World War II but never closed. The refurbishment saw improvements, including the takeover of an auditorium as the gift department. & Rudd is a wine and spirits merchant based in the United Kingdom. The company sells wine from around the world, including en primeur wines from Bordeaux, the company sells a number of wines and spirits under its own label. Other services it offers include wine storage, wine tastings and wine schools, & Rudd is the only company to have eight Masters of Wine in its ranks. The company has a store in Basingstoke and offices in Japan, Hong Kong. Founded by the widow Bourne, the company has supplied the Royal Family since the reign of King George III, & Rudd was his wine supplier then. First they sold coffee, and cocoa, snuff, anything that was considered exotic and new and its proximity to St. Jamess Palace and its fashionable location helped popularity. A first Royal Warrant of Appointment was granted in 1903 by King Edward VII, queen Elizabeth II granted her royal warrant in 1995, Prince of Wales granted his in 1998. Customers have included Lord Byron, William Pitt the Younger and the Aga Khan, in 1923 it created the Cutty Sark Scotch whisky. The Apple shop was a retail store located in a building on the corner of Baker Street and Paddington Street, London. It opened on 7 December 1967 and closed on 30 July 1968, the shop was one of the first business ventures by The Beatles fledgling Apple Corps. The concept of the shop was that everything in it was for sale, the aim, as described by Paul McCartney, was to create a beautiful place where beautiful people can buy beautiful things. In practice, the stock was overwhelmingly fashion garments and accessories, John Lennon vetoed the use of the word boutique, but the venture has come to be popularly called the Apple Boutique. Suggesting a degree of precision and planning not subsequently realized in the management of the business, footage of the event shows Simon Posthuma playing Arabic music on a flute, Barry Finch playing a small drum, and Josje Leeger playing finger cymbals to the guests. Lennons friend Peter Shotton managed the store with Pattie Boyds sister Jenny Boyd, the Apple shop was a financial disaster. Customers helped themselves to the stock, as did staff members, who had difficulty determining which people had come in with. The ethos of the venture and those operating it was antithetic to making accusations of shop-lifting or of calling for the police, the Fools members made a habit of taking their choice of the merchandise. The Dutch designers, Simon Posthuma and Marijke Koeger along with artist Josje Leeger had met Simon Hayes and Barry Finch in London, Barry Finch employed art students to paint a psychedelic style mural, designed by The Fool, across the buildings facades between 10 and 12 November 1967. The concept was borrowed from the painting of the facades of the Lord John shop in Carnaby Street, albeit executed to a design with greater density. Westminster City Council had not, granted consent for the mural, which could be construed as an advertisement, nor had a licence to do this been sought from the landlord, the Portman Estate. Complaints from local traders resulted in the Council issuing Apple with an enforcement notice to paint over the façade mural, in addition, the Portman Estate were prevailed upon to enforce the terms of the lease. Reeves Corner Off Licence. The House of Reeves is visible in the background; while the plot behind the picket fence is the site of the buildings destroyed in 2011. Redington's shop on Hoxton Street as depicted on a "twopence coloured"
Allen's signage at his flagship emporio in Islington, London. Coopers' Yard, the entrance to Charlie Allen's domaine. One of the storefront facades of Granny Takes a Trip (photo credit: King's Road by Max Decharne). Heal and Son Ltd., Tottenham Court Road. A Utility Furniture dressing table made by Heal's, 1947. Oak. The sign of the four poster on the façade of the Tottenham Court Road store. Allens of Mayfair butchers shop a few years before it closed its doors.